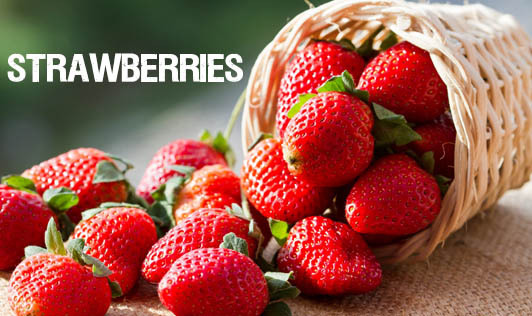 Ranked as one of the favourite fruits by many, strawberries contain higher levels of vitamin C than any other berry. A serving of 100g contains only 44 calories and are also a good source of fibre, iron and potassium. Phytochemicals present in strawberries include anthocyanins, flavonols, catechins, ellagic acid and proanthocyanidins. These are bioactive substances that work with nutrients in the body to provide maximum health benefits and known to protect against cancer. In traditional medicine, strawberries have long been used to cleanse and purify the digestive system. They are said to act as a mild tonic for the liver and to have antibacterial properties. Besides being healthy, strawberries are a very versatile fruit. They can be used in baked goods, salads, beverages, milkshakes, or eaten plain. Some people have an allergic reaction to strawberries, and develop an itchy rash known as hives. This rash is the result of an excess production of histamine by the body, which appears to be triggered by a substance in the fruit. Strawberries are high in compounds known as salicylates and should be avoided by people with intolerance to aspirin - which is made of a similar substance called salicylic acid. People with bowel disorders such as colitis should also avoid the fruit because the seeds may be a source of irritation.